A recent CBC broadcast from the show “On the Island” and an accompanying article highlighted something that has been on my mind for years and is an issue that is up for regular debate among my colleagues. I was encouraged to see this conversation about use/licensing fees for archival materials getting some mainstream media coverage, because it is an important question that is larger than the archival profession. It is a conversation about access to information. It is a conversation about government funding for the sector. And it is a conversation about user rights and the purpose of archival institutions. 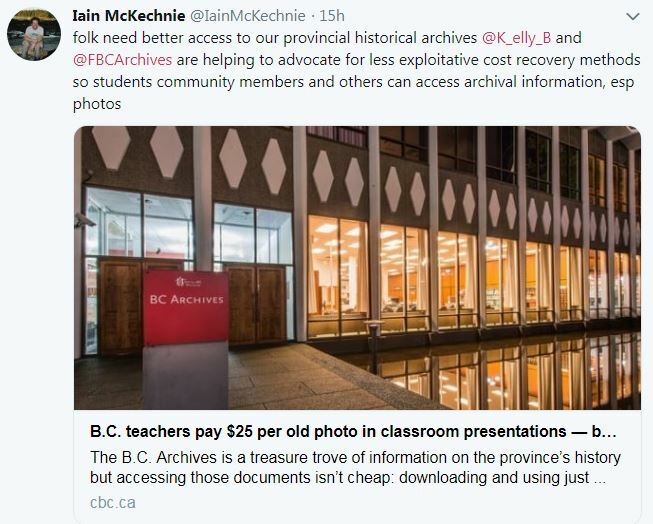 On March 13, 2019, the Friends of the British Columbia Archives released a report on their website to encourage the Royal BC Museum and Archives (RBCM&A) to reduce or eliminate the fees paid by researchers (especially educators) to use archival materials. The report recommends the elimination of licensing fees for non-commercial use of digitized items and a re-evaluation of the licensing fees for commercial use of digitized items within works published/distributed in British Columbia. Among other things for the longer term, the report also recommends that the reproduction fee framework be re-examined and Creative Commons licensing be investigated for use of RBCM&A’s collections. You can check out the full report here or a condensed version on this thread for more info on their position. My intention is not to criticize the RBCM&A – they do great work. My intention is to lend support to the recommendations of the Friends of the British Columbia Archives. I am of the opinion that Archives are in place to serve the public and promote access to materials in their care, within the confines of copyright and privacy legislation. The reason we keep the records is so they can be used, re-used, re-purposed – so that they continue to live and be relevant and serve to educate successive generations about the world that existed before them. The bias, the constraints, the darkness, the racism, the industriousness, the hope… it’s all in the records and if a paywall prevents educators, authors, historians, and the general public from using them then they are useless and we have failed to do at least half of our job. 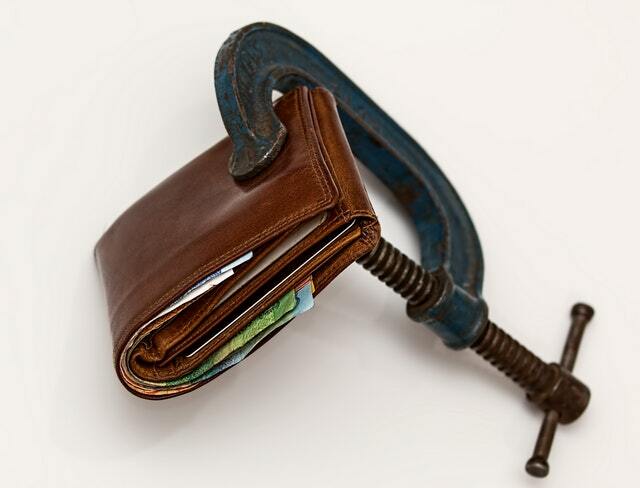 Saying all that – I do FULLY appreciate that use fees can be a source of much-needed revenue. 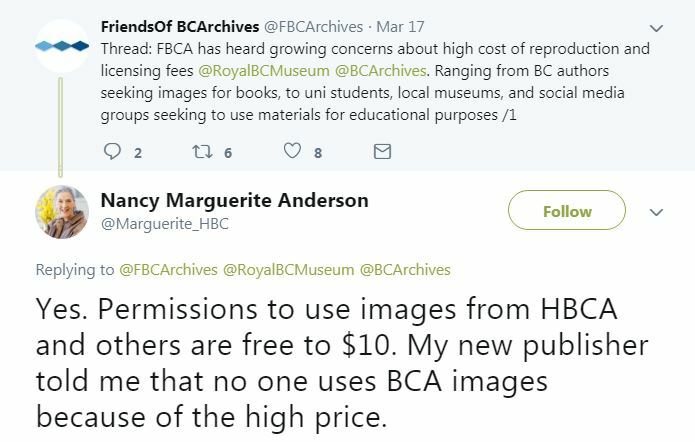 In the CBC article, David Alexander noted that the “focus is really around caring for the collection, ensuring it’s sustainable in the long run, and making it publicly accessible.” I get it – there are competing priorities for any archival institution and it costs money to digitize materials. The BC Government only provides approximately 54% of the Museum’s operating budget. I definitely appreciate that the shortfall must come from somewhere. But – are there other, more sustainable, and less user-focused ways of paying for the digitization work? Once a record has been digitized, how long must users pay for it? How is the cost amortized over time? And how much do these charges prevent use? There is a reason that one of the best used collections of historical materials in British Columbia is the City of Vancouver Archives. The CVA’s online search contains more than 160,000 digital objects and in 2009, the CVA decided to eliminate use/permission fees. This was highlighted as an example of good practice in the Friends’ report. CVA will still charge reproduction fees, but once material is digitized, there are no additional fees levied for use. There was a small impact on revenue once the decision was made to offer high resolution images online; however, it was felt that the research benefits offered to users outweighed the small drop in revenue. The CVA Acquisition Policy also offers donors the option of granting access to copyrighted material through Creative Commons licenses. For third party copyright material, users are now asked to agree to adhere to Fair Dealing purposes before they are able to download the image, for free. This allows for copyright images to be made available online and there is no cost associated with accessing and using the images for Fair Dealing purposes. Because of CVA’s efforts to seek digitization funding and their commitment to access through Creative Commons licenses, a teacher could use the incredible collection of posters from the BC Gay and Lesbian Archives to teach their students about tolerance, homophobia, HIV/AIDS, and any number of issues. This simply would not be possible if the teacher had to pay to use a single image. Granted, not every archival institution is able to use its own funding for digitization and access projects – we are, as always, a significantly underfunded sector. However, I am not convinced that the non-commercial user or even the low-profit commercial user, should be the one to bear the brunt of these costs. We need more advocacy like that of the Friends of the BC Archives to alert government to the needs in this area. We need more granting programs like the National Heritage Digitization Strategy or the BC History Digitization Program. We need more awareness and advocacy around the need for digital access and the real costs associated with it. Otherwise, Archives can’t fulfill a large part of their mandate, records will go undiscovered, and users will turn elsewhere, leave out important records, or use substandard or illegal content. Have any thoughts on this? I would love to hear some more perspectives on the issue. I am pleased that the Friends of the BC Archives has caught the attention of the media with their report. I hope the discussion continues.